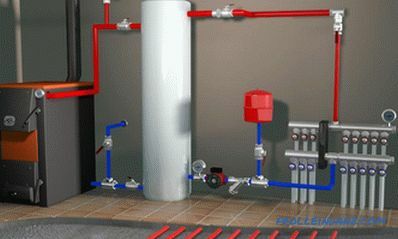 Plumbing has become an integral part of our life. Without such communication, comfort is simply unthinkable. But for many residents of private houses there is one problem - it is the freezing of water in water pipes in the winter. And the cold in many regions of our country are very significant. In order for such a nuisance not to happen, the pipes must be protected from frost or insulated. 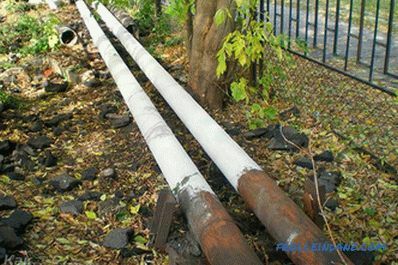 In this article we will explain how to insulate pipes in the street. If your water supply is periodically it freezes in the winter cold, it is most likely incorrectly paved. As a rule, pipes must be laid below the ground freezing level. What is this value, you can ask, for example, the neighbors. 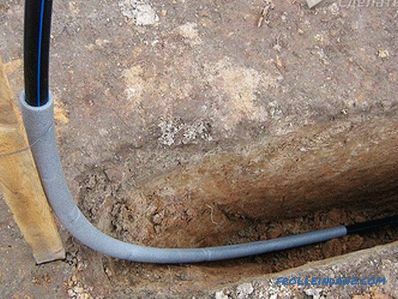 To prevent the pipes from freezing, they should be placed centimeters 20-30 below the ground freezing level. Of course, doing this in winter conditions (when the problem arose) is almost impossible. It is better to wait for spring, when the ground has melted, and to reconstruct it. If you are re-running the plumbing, you should take into account the above fact. Even laying the pipeline at the required depth, it is advisable to warm it. After all, frosts can happen severe, and the height of the snow cover may be small. In these cases, the soil will be frozen deeper. First of all, it's worth talking about the materials used, which can be found on sale a lot of options. They will differ in both cost and efficiency. The first candidate is mineral wool. 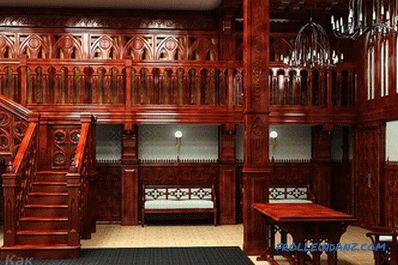 Such material has the main advantage - it is convenient and easy to work with it. Cotton pipe is tightened and secured with building tape. with the help of such material it is convenient to warm any constructions. Mineral wool takes any form, filling all space with a dense mass. The thermal conductivity is very low, which means that the insulation will keep warm well. Another important fact is resistance to decay. A layer of insulation will lie in the ground, and therefore should not rot or deteriorate from moisture. Also mineral wool is easy to find and purchase, the price for it is quite affordable. Foam plastic is often used. This material is cheap, easy to install and does not rot. The only thing to consider is that foam plastic is a fragile material. Therefore, such insulation requires additional protection. Manufacturers produce more modern material. For example, environmentally friendly basalt insulation is already made in the form of cylinders. They are worn on pipes of the appropriate diameter and placed in the ground. Another modern material that can also be found in the form of tubes is polyethylene foam. It is easy to install, and the quality of insulation will be at a high level. A lighter and more modern way was developed by Russian scientists. Here the insulation is made using insulating paint having a pasty appearance. Applying a single layer of such material allows you to replace several centimeters of any heat insulator. Paint is easy to apply to any surface, and the pipes themselves will remain of small diameter, so it will be easier to lay them in the ground. you can turn the heating on and off independently. Today, such systems are available in two versions. 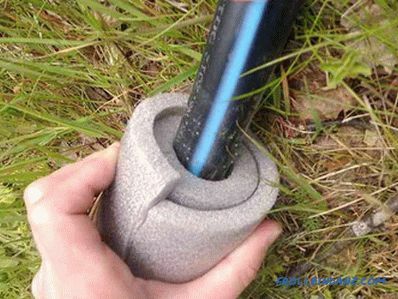 The cable can be placed inside the pipe or wrapped around the outer surface. In any case, the result will be unchanged, your water supply will not freeze even in the most severe frosts. There is one feature here. The cable will be powered by electricity. This means that the electricity bill will increase slightly. Everything will depend on how well you will use such a system. The cable does not have to be turned on permanently If there is a small minus outside, the pipes will not freeze, which means that the heating system can be turned off. 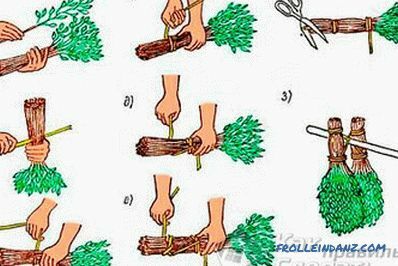 When it is freezing hard, the cable must be connected to the power supply. This is especially important at night. During this period, little water is used, which means that its freezing is most likely. If you If you choose insulation using ordinary materials (mineral wool, polystyrene foam or polyethylene foam), pipes should be laid below the level of soil freezing. The heat-insulating layer itself is laid in the thickness recommended by the manufacturer. 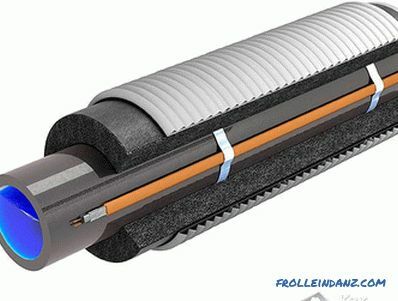 Do not forget that it is desirable to lay the pipeline in the box.So, you get additional protection, and the insulating material will last longer. Special attention should be paid to the entrance of the water supply to the house. In this place, the pipes come close to the surface, therefore, protection from the cold here should be the most effective. It is better to lay the insulation in several layers. The most dangerous section (in terms of freezing) is the exit of pipes to the surface. 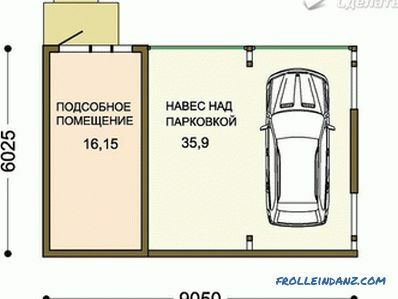 Such plots are located directly in front of the water supply to the house (if communications do not enter the basement). Since they are not protected by a thick layer of soil, they are easily exposed to freezing. 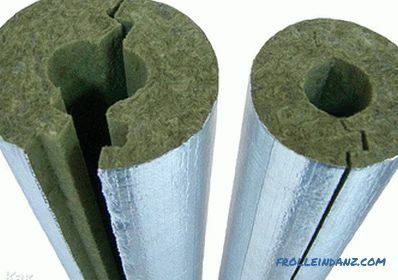 When insulating pipes on the surface, the same materials are used as in the insulation of communications in the ground. The main thing to consider is that this layer is more reliable. It is better to install a thicker insulating material. But in addition to protection from the cold, such areas need an additional waterproofing layer. If you do not make such protection, the insulation will quickly pass into disrepair and frost penetration will not be avoided. Various materials can be used for waterproofing. This may be a film, roofing felt or a box of plastic. Also, the exit can be further protected with brickwork or a layer of concrete. In this case, in addition to protection from excessive moisture and mechanical stress, heat insulation will also increase. If you use a heating cable for insulation, then you need to wind the pipes out of the ground more carefully. Yes, and waterproofing should also be more reliable.